The RCM Solution is a straightforward, no-nonsense presentation of what RCM is and how it can be applied to maximize the productivity and safety of physical assets. It introduces and thoroughly embraces the proven power of RCM’s basic principles and follows a common-sense and practical approach to implementation. 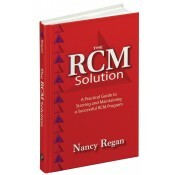 A significant portion of this book is dedicated to SAE JA1011-compliant RCM. Yet, the author also introduces other asset management processes that embody RCM principles when the full rigor of RCM isn’t warranted. The RCM Solution therefore presents a total solution for implementing RCM in any organization. This book will be an invaluable guide to anyone responsible for physical asset management, at any level of authority, from an organization's maintenance manager to the organization's leader. •The principles are presented generically and are equally applicable to any industry that has physical assets to care for, such as defense, manufacturing, mining, plastics, and power generation. •Besides, instructors teaching reliability engineering at colleges and universities will find this book a useful complement to their primary text. 3.1 What Is an Operating Context? 3.2 When Should an Operating Context Be Drafted? 3.3 What is Included in an Operating Context? 5.1 What Is a Functional Failure? 6.1 What Is a Failure Mode? 6.4 What Failure Modes Should Be Included in an RCM Analysis? 6.5 How Detailed Should Failure Modes Be Written? 7.1 What Is a Failure Effect? 8.1 What Is a Failure Consequence?